So there are these two guys I know that willingly live in Minnesota. Yeah, I know, it's cold there. Really cold! But apparently they have some awesome breweries and beers there, which I guess could be seen as a selling point for the state. Anyway, one of the guys, Steve, recently accepted when I was asking around if anyone would like to do a guest review. After your read his review below, be sure to go check out The World of BeerCraft blog they write. Thanks, Steve. P.S. He called you guys "passionate and knowledgeable". LOL. First of all, let me just say thanks to Rob for letting us do a guest review on Daily Beer Review. My beer review partner Duns and I have been following Rob since we started The World of BeerCraft back in December 2010. And although he may not know it, Rob was one of the reasons we started our own craft beer blog. We said “Hey, if he can do that in Florida then we can do it in Minnesota”! And so it began… Our deepest thanks to Rob for the opportunity to share our love of craft beer with his passionate and knowledgeable readers. Now, on to the beer! 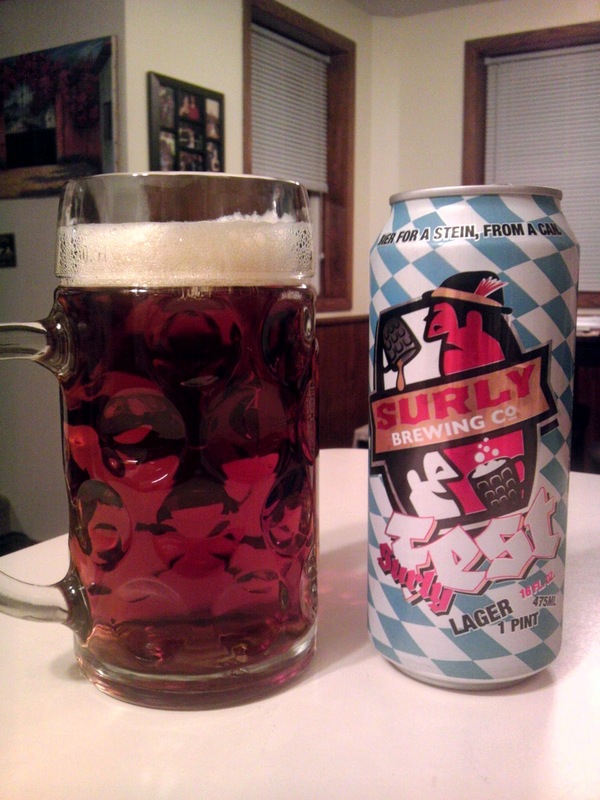 Surly Brewing is a local sensation in Minnesota. Even though they cannot claim to be the largest brewery in MN, they are definitely the brewery that produces the most hype in the Twin Cities. The beers they produce epitomize “craft beer”. They are big, bold, flavorful, hoppy to the point that your tongue will scream for mercy yet will continue to keep you coming back for more. In fact, Surly’s Russian Imperial Stout – Darkness – draws beer enthusiasts from across the country every year just to get a bottle of what is widely considered to be the best RIS in the Midwest, if not the country. And they have only been in existence for five years! A deep amber-orange color fills my Oktoberfest-inspired stein. Only a thin lacing of residual white foam hangs around after frothing up towards the end of my pour. The aromas are ripe with the spice of rye and earthy hops. Quite the inviting aroma for a cool autumn evening. The flavors are undoubtedly rye but not accompanied by a bold spice. A solid base of sweet caramelized malt helps to subdue any overt rye spice that can sometimes be found in other rye beers. Those earthy hop flavors come through in the finish with just a slight bit of alcohol warmth. Overall – Most people would be hard pressed to use the term ‘balanced’ with any Surly beer, but Fest manages to be just that. The rye flavors are nicely intertwined with a subtly sweet malty base supported by an earthy hop bitterness to complete a deceptively complex brew. 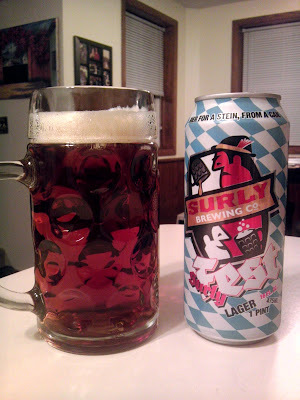 Surly Fest is a great seasonal beer for anyone who enjoys a twist on a classic favorite.